The United States has 809 vehicles per 1,000 people according to World Bank statistics. If that number were divided evenly among the population, over 80% of the population would own a car. How many think of their car as a potential source of income? How much of the average vehicle’s capacity is filled on any given trip? Carpooling and its evolution to ridesharing can do more than ease congestion and cut carbon emissions; it can provide extra income and reduce fuel expenses for car owners while enabling simpler transportation for those who don’t own a vehicle. 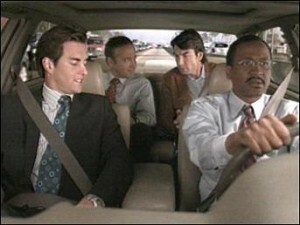 Carpooling is already common in European countries and some American workplaces. It has been gaining popularity as part of the cooperative consumption movement, using social networking to enable people to share more and buy less. The concept is expanding from the traditional work carpool, taking some cars off the road and filling vacant seats in others. Simply put, ridesharing and carpooling can work for any destination to which people drive. All you need are people going to the same place. If your children and your neighbors’ go to the same school, why drive multiple vehicles which are all half-empty? The same goes for any of your or your children’s activities: sports, clubs, dance classes, school events, church meetings and more. You can start with something as small as scheduling haircuts at the same time with a friend or two. You save, and you get more time to socialize. Are you going to a kid’s birthday party where you know all the guests? Try scheduling a shopping trip to buy the presents. You won’t be rushing around town at the last minute trying to find the perfect gift (or if you are, you’re all in it together at least). As a bonus you can share gift ideas, pool money for one large gift instead of many small gifts, and ensure that you’re not buying duplicates. Carpool to the grocery store and share recipes and tips. The locations that you can carpool to are endless, as are the benefits. That can be grocery stores, dentist appointments, meetings, church groups, poker nights, or any activity to which you and others drive. Many websites can help you find potential carpoolers online, such as Zimride, eRideShare and the rideshare section of Craigslist. To find company on your regular commute, check out CommuterPage.com. For those always on the go, smartphone apps like Avego and Reward Ride give ridesharing information in real time with. Determine in advance who will be driving and where and when each member will be picked up. This could mean meeting at the home of the driver or a central location, or the driver may pick up each member individually. Factors that can help decided who will drive include location, size and fuel efficiency of each member’s vehicle. Have you ever had to share a small space with someone whose habits and preferences were like nails on a chalkboard to you? To prevent stress and make the ride pleasant for everyone, set ground rules. Discuss whether eating, drinking or smoking in the car is allowed, what volume and variety of music each person prefers, how long to wait for a latecomer and whether unscheduled stops are acceptable. For a simple carpool in which everyone drives approximately the same distance, everyone saves the same amount of money and no further compensation is needed. If some vehicles in your carpool are more efficient than others or if one person drives more often, you should calculate an approximate cost per mile and compensate each driver according to his or her mileage. Set the pay period to keep it organized, just like any other service. Make a list of each member and their contact details. Set the expectation that if a member doesn’t need to be picked up on a certain day, they should let the other members know, preferably in advance if the situation allows. Similarly, if the driver is sick or has an emergency situation, he or she should notify other members as soon as possible so that an alternate driver can be prepared to take over. Ridesharing can benefit both parties even when one doesn’t have a car. Many college students make trips home or travel to visit friends and find rides via Facebook or school rideshare boards. Companies offering charter bus service with free wi-fi and power outlets have appeared across the country. Routes connect cities for a much lower cost than driving or flying. If you need a car occasionally, you have more options than borrowing your friend’s old rust bucket. Carsharing.net connects to resources, car sharing companies and car rental organizations. Better yet, rent a car from a person instead of a corporation through RelayRides, Getaround or JustShareIt. Those who offer their car for rent profit when someone else uses their car instead of letting it sit in the driveway, and others get the benefit of a car at a lower price. Be warned that insurance companies have mixed feelings about the idea; some may threaten to cancel your coverage, while some compare it to using a car for pizza delivery and don’t see an issue. The three companies listed above offer insurance up to $1 million. Another startup, Wheelz, has organized carsharing networks on the Stanford, UC Berkeley, USC, and UCLA campuses. Not owning a car has never been so convenient. So all that leaves you to answer is to own a car or to not own a car?